Like the coming of the tide and the dawning of the sun, another Star Wars movie is upon us! Unlike last year’s Rogue One spin-off, Star Wars: The Last Jedi is part of the main franchise! It’s Episode VIII! That’s pretty cool, right? That means this movie is super important and cool! I liked The Last Jedi, but I wasn’t blown away. I don’t consider it the best Star Wars movie since Empire Strikes Back. I think The Last Jedi was a fun and resounding adventure film, with plenty of cool Star Wars stuff, but nothing really beyond that. It’s the sort of movie you super enjoy while watching, but once you start thinking about it, there was a lot wrong with the movie. I know a lot of these complaints have been making the rounds all over the Internet, but now you can read my take on them! So join me after the jump for my full review of Star Wars: The Last Jedi, as well as plenty of long-winded rants about the stuff that bugged me! And expect FULL SPOILERS for The Last Jedi. Disney is in the blockbuster business, and business is good. They have mastered their craft. The Last Jedi is a big, exciting, bombastic action film with heart, humor, energy, huge hero moments and memorable, awesome characters. It is a wildly entertaining time in the theater. I don’t think I was ever bored or bothered by the movie. It’s pure fun. It’s also hilarious. I loved laughing with The Last Jedi and am grateful for the humor. I loved seeing all of my favorite new characters again. I liked Rey’s journey through the Force and her attempts to sway Kylo Ren — more on him later. I also really liked that Rey’s parents were nobodies. That is far more interesting than if she was the long lost granddaughter of Obi-Wan Kenobi, or anything similar. I liked Finn, I liked Poe, I suppose BB-8 was OK. I liked Luke and Leia, Luke especially. He was great in this movie. Honestly, most everybody was really solid in this movie. I had a really good time at the movie, but like I said, a lot of things are bugging me. The movie is a little too polished for my tastes, and I think that’s because of it being a modern Disney blockbuster. Between these movies and the Marvel superhero flicks, Disney is developing a house style. It hasn’t bothered me in the Marvel movies, because those have really started to branch out into different genres. But Star Wars movies are always going to be Star Wars movies, and I’m a little worried. Star Wars is supposed to be the space action franchise that’s not afraid to get it’s hands dirty. It’s the sort of franchise that spends time in a dirty alien bar, creating characters like Jabba the Hutt, and making heroes out of roguish scoundrels. But The Last Jedi is a little too polished, a little too glossy and spacey, the aliens are a little too manufactured. Even the space casino is exactly like any casino you could ever imagine. There’s no heart. 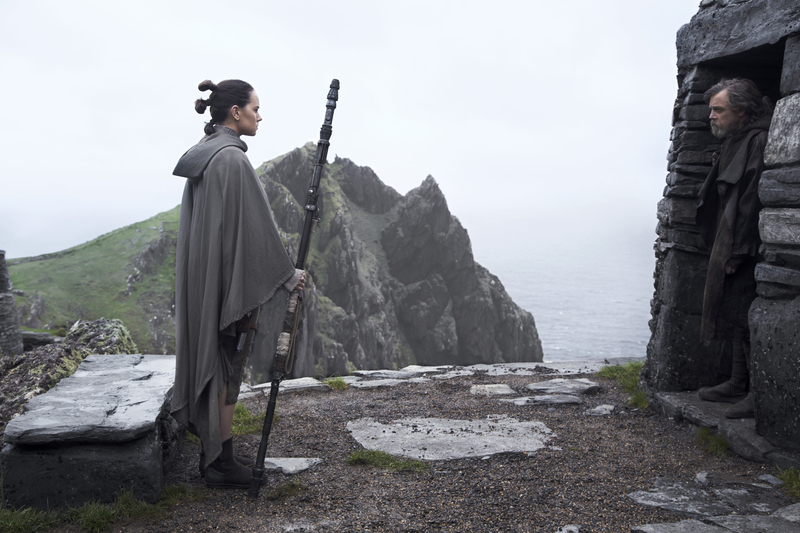 The Last Jedi feels like it’s more style than substance. And while the style is awesome, I would have liked a bit more substance. I think the main problem I have with the movie is that the movie separates all the main characters and then never takes time to stop and smell the roses (pun not intended). My favorite part of The Force Awakens were fun new characters, who played really well off each other. 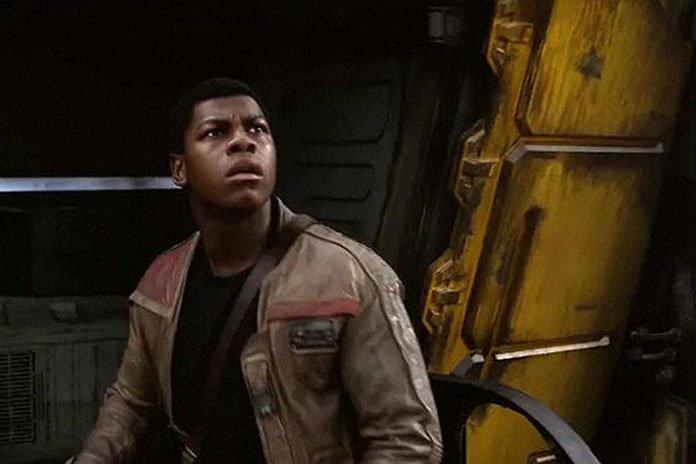 My favorite new character is Finn, and I like Rey and Poe Dameron, too. They were great together in the first movie, with clearly defined character traits. But The Last Jedi splits them all up, most of them for the entire run time. So we lose all the great character interactions that helped make The Force Awakens so much fun. 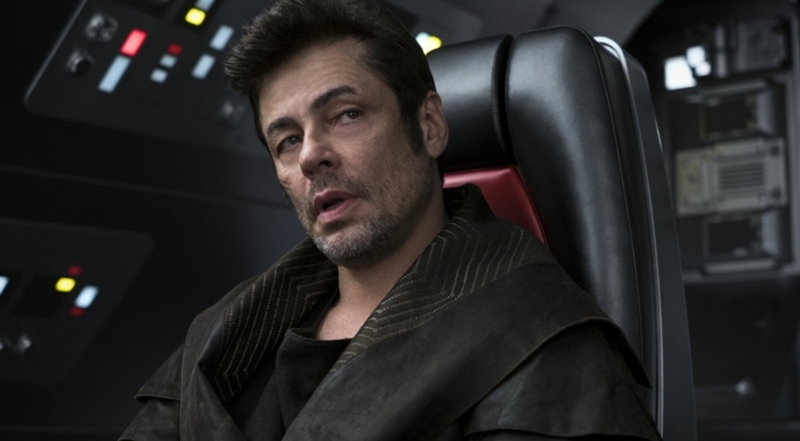 Instead, everybody gets partnered up with new characters, like Rose, Vice Admiral Holdo or Benicio Del Toro. And while these characters serve their purpose, none of them are as much fun or as well-developed as our main characters. Heck, I didn’t even known Del Toro’s character name until I just now looked him up on IMDB. It’s DJ, apparently. Great Star Wars name. Then the movie is so flashy and in such a rush, than none of these characters ever get time to just slow down and hang out. Everybody is always on the movie rushing to the next big thing. The fate of everybody is always constantly on the line. 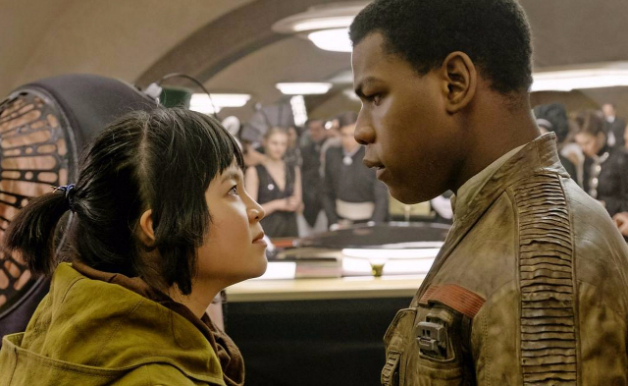 So as much as I wanted to like Rose Tico, we barely spend any time getting to know her. And what we do learn is later undercut. I thought she was supposed to be a mechanic who stays in the back of the battle? What was she doing flying one of the sand-skimmers in the finale? Not that we ever really saw her being a mechanic. I keep thinking back to the scenes in Empire Strikes Back where Han and the gang accidentally fly the Millennium Falcon into that giant asteroid worm. We got several scenes where the movie stopped so that the characters could go outside, walk around and wonder where they were and what had happened. Nobody was in any rush, especially not the movie, and we got some solid character building. Likewise, all the scenes of Han and Leia getting closer on the Falcon. The characters were allowed to interact and hang out and get to know one another, and we were allowed to get to know them. I don’t think we got much of that at all in The Last Jedi. Step back from Rey’s man! Finn and Rey don’t even get to say two words to each other. They get one hug at the very end of the movie. As a Finn/Rey ‘shipper, that was hugely disappointing. Likewise, even Finn and Poe don’t get much time together. They get a couple of scenes, but they’re over quickly. Those two were such immediate pals in The Force Awakens that an entire movement has sprung up to get the two together romantically. Luke had a lot of great scenes with Rey, and even that big one at the end with Kylo Ren. But his scene with Leia was too short for my tastes. And he only got one quick moment with Chewbacca! That was a let down. When Luke snuck about the Falcon while Chewie was having dinner, I so wanted Luke to just sit with Chewie and ask him about Rey. Chewie definitely got shortchanged this movie. And I’m just gonna come out and say it: I thought the Yoda cameo was gratuitous. It was well within the realm of something that can happen, and Yoda had some good lessons to teach and some great lines. But I thought he looked really awkward. Like, he was just this photoshop of Yoda who was inserted to give the fans something to cheer for. I’d heard that a classic character made a surprise appearance, and I had gotten my hopes up that Boba Fett was going to be the code-slicer that Finn and Rose go to recruit. That would have been pretty cool. Did we even see any stars or wars? 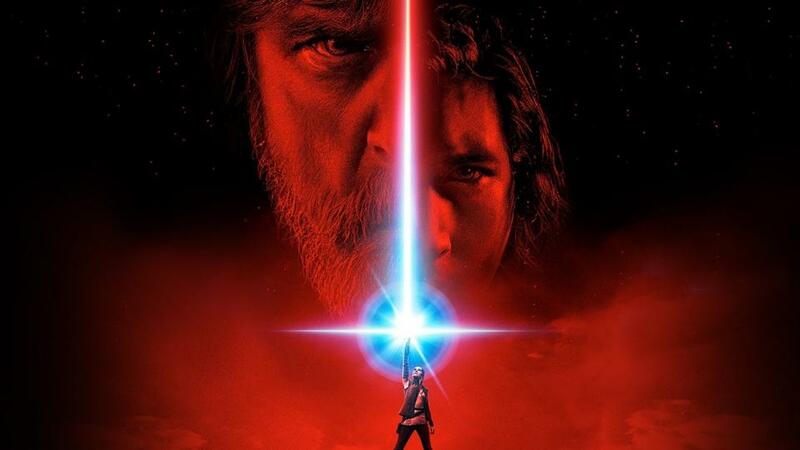 There’s just not much to the story of The Last Jedi, overall. The Luke/Rey/Kylo stuff is cool, I’ll give the movie that. But overall, the movie is just about a slow speed space chase. That’s it. It’s like a brief aftermath battle from The Force Awakens stretched out into this bigger thing, but it still feels very contained. Yeah, a lot of characters go off on their own for side plots, but the movie is still just about a single pursuit. This slow pace would normally be a great way to expand upon the characters, but as I said before, the movie packs in too much stuff and is in too much of a rush to spend time with just the characters. It’s a slow speed chase that’s still packed to the gills with action and excitement. And when you get into the specifics, a lot of the story just doesn’t work. 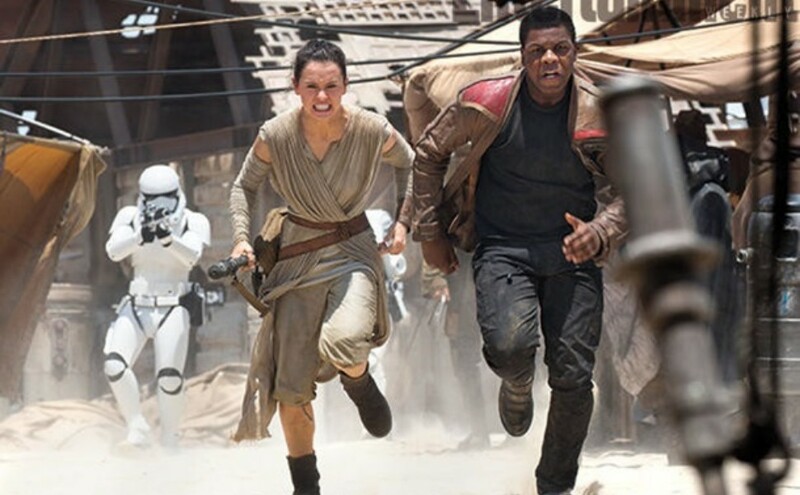 Finn and Rose’s big mission, which takes up a huge bulk of the movie, doesn’t actually accomplish anything! They come up with this big plan, go all the way to a casino planet and sneak aboard a First Order command ship…only for their plan to utterly fail before they get a chance to even try. And it fails not because of anything they did, but because they happened to pick up a Benicio Del Toro along the way. And it’s not like their being on the First Order ship helped Rey in any way. Actually, they did accomplish something: they got a ton of Resistance people killed. It’s only because Finn and Rose dragged Del Toro into the mess that the First Order found out about the fleeing transport ships. So Finn and Rose are able to escape and Poe is happy to see them, but their actions directly led to all those blown up transport ships. In fact, had Finn, Rose and Poe not done anything, then Vice Admiral Holdo’s plan would have gone off without a hitch and many more Resistance members would have survived. Which stinks, because Holdo was a very underwhelming character. She gets a big emotional scene with Leia, despite us knowing nothing about their relationship/history. And Holdo also gets the biggest, coolest hero moment of the entire movie. But again, we barely know the character. I read somewhere, and totally agree, that she should have been replaced by Admiral Ackbar. We actually care about that guy, and his scene with Leia and his heroic death would have meant something, dammit! Instead, they kill Akbar off screen. I’ve said it before and I’ll say it again: I do not care about Supreme Leader Snoke. I don’t get the fandom’s interest in this character. He’s nothing. He’s less than nothing. He’s a pale retread of the much more devious and interesting Emperor Palpatine. He’s just an uglier, less-developed version of Palpatine who came from nowhere, apparently, and yet is just the most super evil guy ever, and a master of the Force. I didn’t care for him in The Force Awakens and I definitely don’t care about him now, even if he’s given a really spiffy golden bathrobe. We don’t learn anything about his origins or where he even comes from. We don’t find out how he got his tendrils into Ben Solo. There is zero depth given to Snoke. He’s killed in a really cool way, but he’s worthless as a villain and adds nothing to Star Wars. I’ve seen a lot of people online point out that we didn’t know anything about the Emperor either during the original trilogy, and that’s not entirely true — we knew he was the Emperor. The Empire is one of the greatest villain groups in the history of fiction. The original Star Wars movies do an amazing job of setting that up. So when we learn there’s an Emperor at the head of it all, his reputation precedes him. He’s the leader of all this? And he’s Vader’s evil dark Jedi master? Great! The problem, then, with not knowing anything about Snoke comes back to the fact that the First Order is just a watered down, retread of the Empire. That was a major complaint I had with The Force Awakens, that the First Order is just a knock-off Empire. So if Snoke doesn’t have his own story, that reinforces the idea that he’s just a knock-off Emperor. And is that really what we want from this new trilogy, this continuation of the story? For the villains to just be cheap knock-offs of what came before? Especially when considering that writers and other creative people exist. 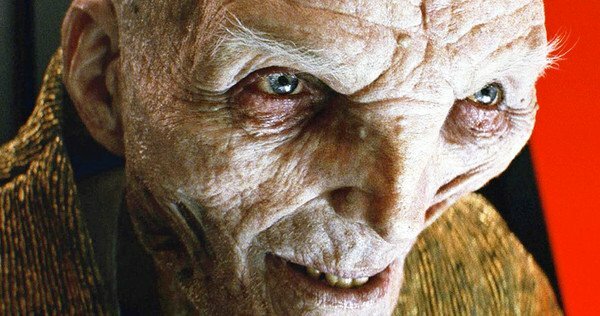 Did nobody give Snoke any thought whatsoever? Did they really just say, “Yep, crappy knock-off of the Emperor, go with it”? Because that’s what it feels like. I also don’t like General Hux. 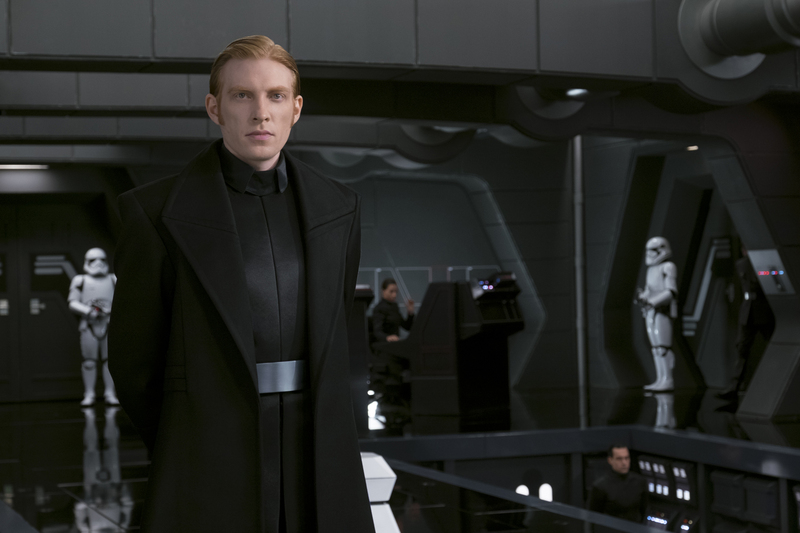 He’s not menacing, he’s not threatening, he doesn’t live up to the Nazi/fascist style of the First Order. He’s treated like he should be comic relief, but he’s also too wannabe forceful to be comic relief. The First Order is not funny. They’re evil, they blow up entire star systems. They’re fascists. But they’re led by this unimposing wannabe jerk who disappoints at every appearance. Speaking of the First Order, I don’t like how The Last Jedi basically reset the galactic conflict back to the start of the Star Wars movies. The opening crawl really bothered me, because this movie is all about the First Order having the Resistance on the run. Did blowing up Starkiller base accomplish nothing? Are we really back to the Empire vs. a small band of Rebels? Every time I saw Leia I felt bad for her because, after everything she’s done, she’s right back where she started. At least I liked Kylo Ren and Captain Phasma a lot more this time around. 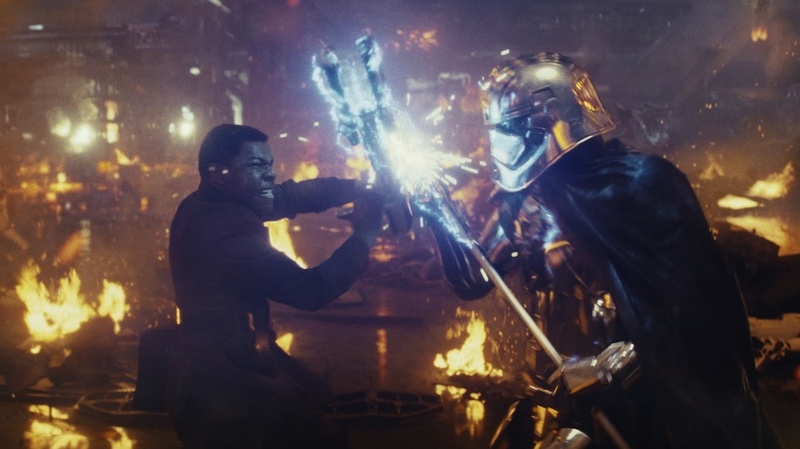 Phasma gets a lot more time to shine, and she’s great. I definitely like her rivalry with Finn. And I finally get Kylo Ren. I read a solid explanation of the character online a couple months ago and I can definitely see the real Kylo Ren. He’s not supposed to be as badass as Darth Vader. He’s the whiny, pathetic kid who is trying desperately to be that cool. Stuff like his badass helmet are just for show, just him trying to be cool and dark. It totally works for the character and really comes across in The Last Jedi. Like I said before, I especially enjoyed the Rey/Kylo stuff. It was meaningful and heartfelt, and I felt a real connection between them. 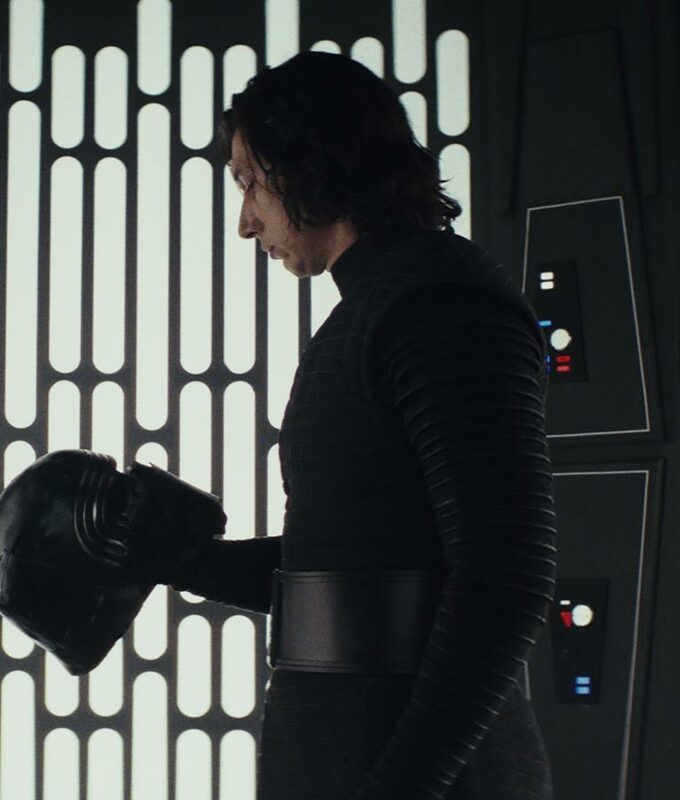 I especially enjoyed when Kylo turned on Snoke and had a badass lightsaber fight side-by-side with Rey…only for him to stick to his plan and not just join her in being a good guy. I definitely think Kylo Ren came into his own as the main villain of the new trilogy in this film. He’s the one character who definitely got some good character growth. 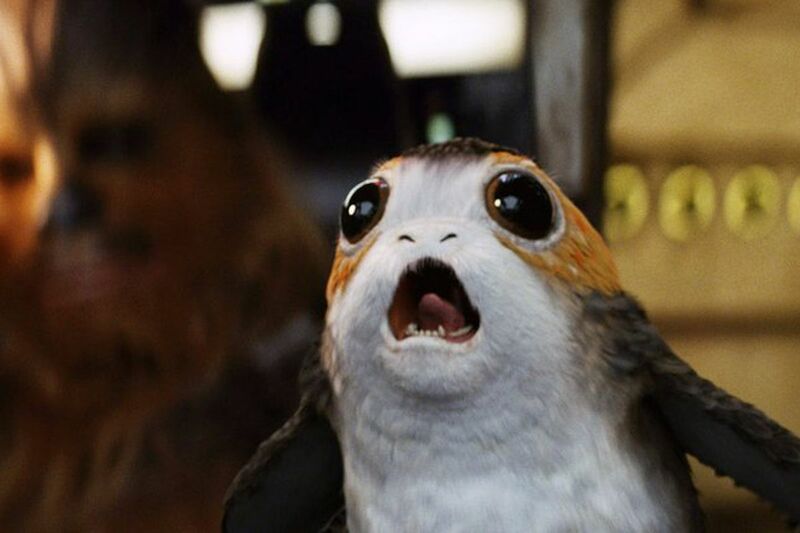 I wrote about this only a couple weeks ago, but I do not care for Porgs. They’re stupid little cutesy things manufactured by focus groups and marketing gurus to appeal to the maximum number of merchandise-buying people. Same with BB-8. And now that I’ve seen Porgs in action in The Last Jedi, I dislike them even more. They add nothing to the film other than cutesy comic relief. At least Ewoks actually contributed to the story and the universe. Porgs are just stupid little things designed to appeal to your wallets. I’m glad Chewbacca ate them. Do you have a moment to talk about the Force? Look, here’s the deal, I can be something of an idiot. As much as I love fiction and storytelling and want to be a professional writer myself, I often find that I can be utterly clueless about themes and meta narratives and all that deep dive stuff. 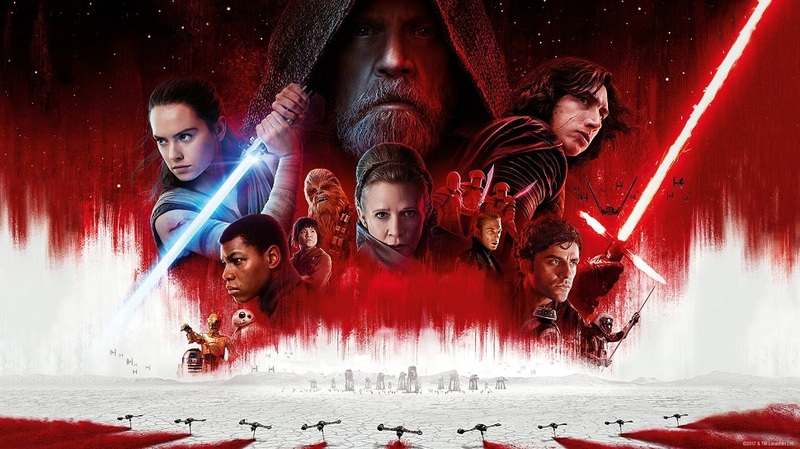 I watch a movie like The Last Jedi and I enjoy it on the surface for all the cool action and special effects, but then I get nitpicky about the story not lining up to my tastes or characters not mattering as much as I would have liked. I don’t think I had any expectations for The Last Jedi, and I’m not disappointed that those non-expectations weren’t met, I’m just being nitpicky. But I also need to acknowledge that I’m probably missing the point. I watched the Movie Bob Last Jedi debriefing video the other day and he understands movies a lot better than I do, and he laid out all the ways that The Last Jedi is deeper and more meaningful than I realize. And I gotta say, I agree with pretty much all of his points! I still think I’m allowed to dislike Snoke, but Movie Bob explains the point of the casino planet and he’s exactly right! He explains the point of Rose Tico and everything Kylo said about letting the past go. These are thematic and narrative ideas that flew right over my head, and I’m always disappointed in myself for not getting them. If you can’t watch the video yourself right now, basically he points out that one of the main thrusts of the new trilogy is a focus on the common person. Previous Star Wars movies were about the nobility and the elite, like Princess Leia or the Jedi Order. The new trilogy is putting that in the past and focusing more on the little guy, like Rose, Rey and Finn, or the kids on the casino planet. And the casino planet represents the opulence of the past, the rich nobility who lord over the little guy. Likewise, Finn’s reaction to the casino is important. He’s instantly enamored by the opulence, and I totally forgot that he comes from a life of regiment as a Stormtrooper, so he’s never even seen this level of luxury. And then Rose points out that this luxury comes from hurting the little guy, and it teaches Finn an important lesson, one that solidifies him as “Rebel Scum” instead of being a guy who’s always looking for his way out, or is only really worried about his friend Rey. Then there’s my problem with Finn and Rose’s plan being an utter failure. It really bugged me that we spent so much time with this side plot, only for it to not matter at all to the movie. But clearly I forgot all about the entire point of Yoda’s cameo: that failure is crucial for learning. So yes, they fail, and people get killed. But failure is a part of life, and people are allowed to fail, it happens. The important thing is that they need to learn from it. 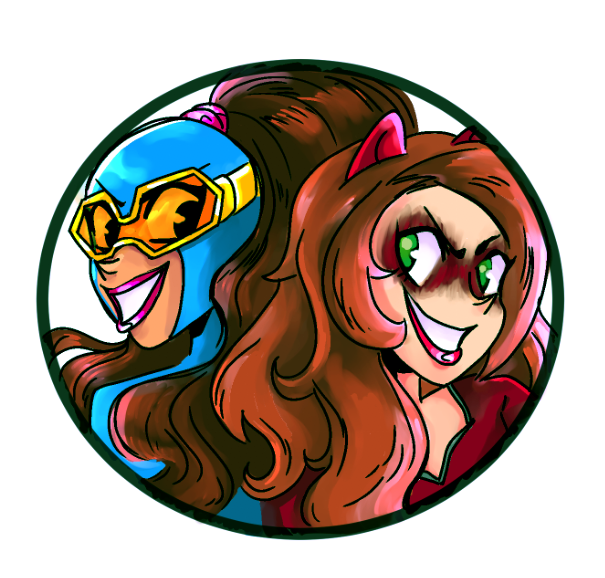 On the other hand, there’s also the guys at Red Letter Media who share some of my nitpicks! So there are good arguments on both sides. Thankfully, the Internet exists and I’m able to watch Youtube videos of people far smarter and more insightful than myself. Posted on December 20, 2017, in Lists of Six!, Movies, Reviews, Star Wars and tagged Star Wars: The Last Jedi, The Last Jedi. Bookmark the permalink. Leave a comment.